Its great. I would recommend this anime to anyone.Its great. I would recommend this anime to anyone.Its great. I would recommend this anime to anyone.Its great. I would recommend this anime to anyone.Its great. I would recommend this anime to anyone.Its great. I would recommend this anime to anyone. Easy going episodic approach. What I like is the dead pan delivery/comments of mai. The narrator bit gets old, and there really is no progression in any of the characters. Yet I found I enjoy it enough to continue through the series. I enjoyed watching this series and I love Rumiko Takahashi's work. Rinne is entertaining, hilarious, and has great characters. However, having watched (and loved) Inuyasha, I was surprised to see that the plot in Rinne was more episodic than a grand, continuous story. 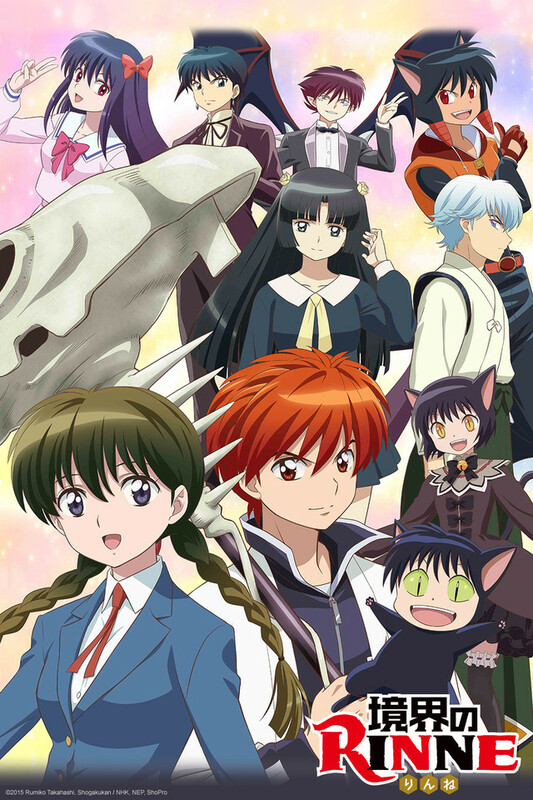 If you're looking for a light anime with a comedic relief and some fantasy elements, Rinne is definitely for you. Good show makes me miss Inuyasha but..
Sooo is it worth the watch yes... top of the list watch maybe... do I add it to the list for others to watch yes. It's not the high life of my week of o snap new ep but it's a cute show with funny story lines and characters. Little suspense here and there but does sometimes have to much filler. It is like a jr version of Inuyasha case no one really dies and yet the main character can't tell the girl how he feels and the others are doing extra in their love lives. It's not my type, so why do I like it? I don't know what it is about RIN-NE, but after 30 episodes I am still watching it. I usually like strong, fast-moving plots and/or echhi, and even many of those lost my interest long before 30 episodes. RIN-NE has neither, yet somehow it is just fun to watch. I'm always a sucker for Rumiko Takashi's shows. I have every episode and movie of Urusei Yatsura, Ranma 1/2, and Inu Yasha... even though Inu Yasha lasted far too long. This is an episodic comedy series. There is no overall plot. It's like popcorn. I think the only problem with it is that I keep comparing it to Ranma 1/2, and it falls short. The characters just aren't as interesting, the situations aren't quite as funny, and it's just a little too silly. Rinne is an unusually nice guy for a Takahashi male lead. Sakura is also unusual for a Takahashi female lead, in that she is very much not an action girl. She's also unusual in having a very non-confrontational relationship with the male lead, and showing very few emotions. She is unfazed by even the most terrifying of supernatural entities, which can be a drawback at times (she should learn to run from dangerous spooks). Some might find her a bit boring, but I think her personality is a refreshing change from previous character types. I can't quite give it five stars, but I'm still addicted to it. Sakura is calm and reasonable. That may not seem a lot to say about the main female character of an anime. But as a fan of Rumiko Takahashi, one knows that the lead female character is almost always violent toward the male lead. For this alone it is worth a watch. So I did, and I enjoyed it quite a bit. This is a fun show, aimed at a younger crowd. It's light, not too deep. The protagonist helps ghosts pass from this world to the next. His friend can see ghosts too, and although she doesn't have any other special powers, she helps them in her own way. There's an interesting grandma character and a low-life dad figure, and a few others to flesh out the cast. The entire production was average across the board. This is a show to watch if there's nothing better or if you just want something light. Jokes, lots of jokes but not quite like other comedy anime. Instead of focusing on sexual and gross humor it mostly focuses on misunderstandings, tricks, a little bit of sad humor (Rinne is a very unlucky guy, his life can be kinda depressing), and jerks sometimes getting what they deserve. Things are nicely explained for those of us not as knowledgeable of legends and culture. The opening and ending theme change was jarring but after awhile I got used to it, though I still prefer the original music. Lot of nice little details. Sakura is an unusual heroine in that she doesn't get emotional, the closest thing to emotion is pretty close to passive but it's there. I think it's actually a nice change. The characters are goofy and mostly loveable (obviously the jerks aren't so loveable) and the story has quite a few heartwarming moments. The story mostly is one plot per episode but there are some things that carry over. but overall it's something comfortable and satisfying like a nice cup of cocoa. I appreciate both the warm surface and the richer, darker, undertones. Really looking forward to season two.